According to the Tennessee Department of Transportation, 114 motorcycle collision fatalities occurred in 2011 across the state. Due to the vehicles structure and design, motorcycle riders have an increased risk on the roads and highways of Tennessee, as compared to the motorist of a standard vehicle. The U.S. Centers for Disease Control and Prevention (CDC) states that slightly below one-third of all fatal crashes involving motorcyclists, the biker had a Blood Alcohol Concentration (BAC) of more than .08 percent (the legal limit). Motorcycle DUIs are a serious problem in Tennessee, causing a massive number of traffic injuries and fatalities. An impaired motorcycle driver is automatically placed in a dangerous situation. Drivers who operate vehicles under the influence of drugs and/or alcohol are at a severe disadvantage. With limited ability to perform functions normally, motorcycle drivers under the influence have slower reaction times, difficulty focusing on the roads, trouble balancing, as well as a number of additional impairments that increase the likelihood of a motor vehicle collision. Greg Coleman Law believes that motorcycle riders under the influence of drugs or alcohol must be held accountable for the damages and injuries in which they cause to innocent accident victims. If you or a loved one has suffered from any injuries following a motorcycle collision, a Knoxville motorcycle DUI lawyer from Greg Coleman Law is prepared to take on your case today. We are able to provide legal services to motorists throughout Tennessee. To learn more about your legal options, complete a Free Case Review today. Unfortunately, when a traffic accident involves a driver who has been drinking, the injuries tend to be much more severe, often debilitating. With an inability to fully control reactions and normal functions, motorcycle DUI drivers are often traveling at high speeds, making dangerous decisions, and putting many lives at risk, as well as their own. Auto accidents involving impaired drivers are almost always more severe, adding a motorcyclist to the equation makes the potential injuries much more seriously, possibly fatal. If you or a loved one has suffered from any of the above injuries, a Knoxville DUI lawyer is prepared to help guide you through the litigation process. Combining years of experience, dedicated research, and a strong passion for the law, Greg Coleman Law ensures that our clients are given unmatched customer service. We understand how difficult these times can be and make sure that we make this uncomfortable situation as comfortable as possible. Get started today by completing a Free Case Review on this page. A Tennessee driver is considered to be driving under the influence whether they are using prescriptions drugs, narcotics, or alcohol. Any kind of impairment to the motorists ability to navigate the roads safely with a sharp, level head places all drivers on the road at risk. All 50 states in the U.S., including the District of Columbia, have laws in place stating that a driver who is over a .08 blood alcohol concentration is an impaired driver. These impaired drivers are subject to the consequences of the law, regardless of whether or not their collision caused injury. Those who survive a motorcycle DUI accident often choose to pursue a personal injury lawsuit against the negligent motorist. The victim and their family may be able to recover compensation for their damages, third party damages, and punitive damages depending upon the details of the claim. Navigating the litigation process can be rather complex. As a result, many accident victims choose to hire a Knoxville motorcycle DUI lawyer to help them throughout the process. 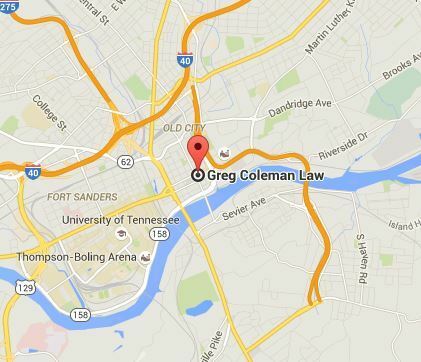 Greg Coleman Law has many years of experience in motorcycle DUI litigation. Our injury lawyers understand the interworking of the legal system, insurance companies, and every other aspect of the litigation process. With this knowledge, a dedicated staff, and a commitment to intense research and investigation, we are able to put together a case for our clients that breed the maximum compensation possible. If you are not sure whether or not a personal injury claim has been filed, contact our motorcycle accident law firm to discuss your case during a free, no-obligation consultation. Our attorneys will get to know you and your case, discuss potential options, and decide the best means of action. You can trust that we are consistently pursuing the protection of your rights. Complete a Free Case Review today for more information.